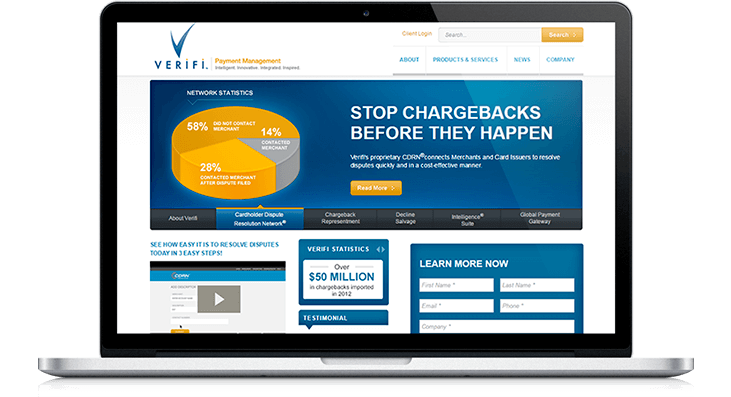 Verifi is a full-service provider of global electronic payment and risk management solutions for card-not-present (CNP) merchants. Verifi is a payment management service that works with top merchants, acquirers and banks to reduce risk on payment collection. The company's old website was seen as no more than an online brochure. While it did a decent job in getting information across, it didn't engage visitors, generate leads or provide an exceptional website experience. Verifi approached LyntonWeb to redesign the website and create an inbound marketing machine with great visuals and succinct, easy-to-understand navigation. Since Verifi was getting started with inbound marketing, our team built the website on HubSpot to allow for easy updating for content, blog posts, landing pages and emails.